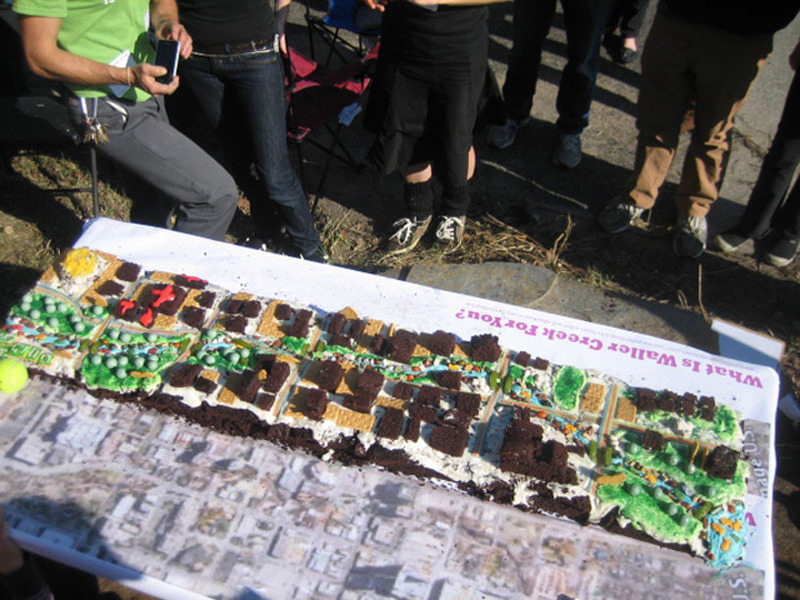 Project: Build A Six Foot Long Chocolate Cake Master Plan, Change A Place. Imagine thirty people standing on the edge of a street in Austin, Texas intently building a six foot long chocolate cake master plan of a largely unknown creek corridor hidden in the midst of their Downtown. Eight of the builders were supposed to be there, the rest, baffled AND excited by the scene before them, had wandered up, simply asking, ‘Can we help?’. 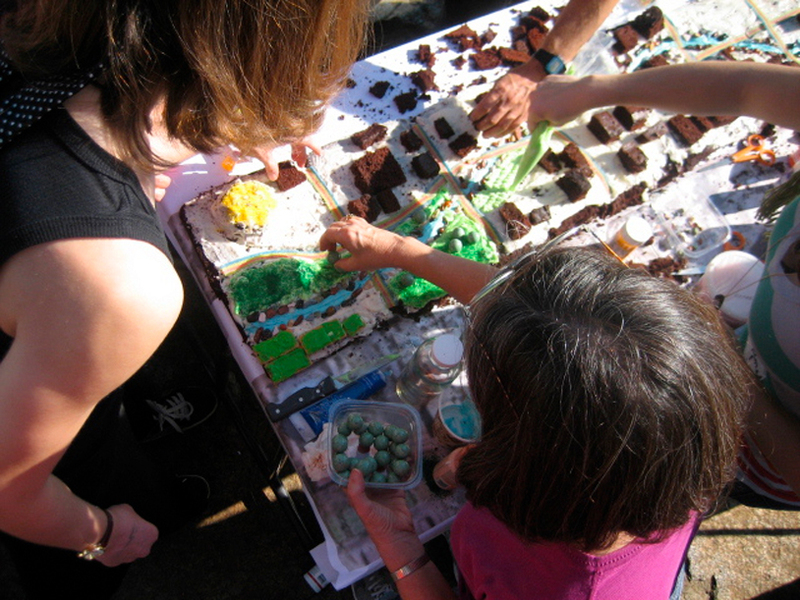 Kids thoughtfully placing green jawbreaker trees along the ‘Creek bed’, adults meticulously painting white icing lines on graham cracker tennis courts, everyone discussing what goes where and hundreds of people lining up, chomping at the bit to exchange their ideas for the Creek’s future for a piece of the fantastic cake master plan. Formerly knowing little about either the under-loved public space right in their very midst or the negligibly attended City planning meetings, participants then drifted off to other events in the neighborhood abounding with stories of a ridiculous cake creek and new ideas for how the space might be used in the future firmly emblazoned on their chests. 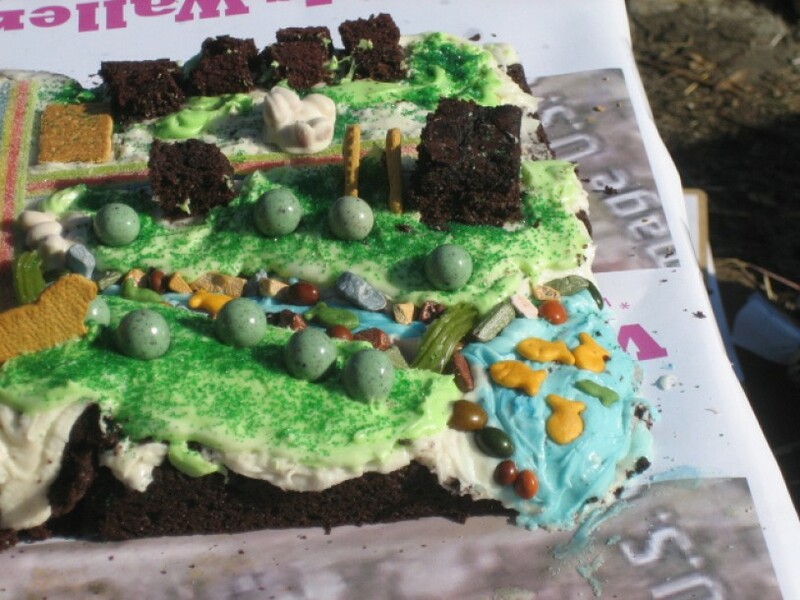 It’s been nearly a year now since we made the Waller Creek cake and quite frankly we’re feeling a bit nostalgic. That cake was great. The project was fantastic. The response was better than any of us could have expected. 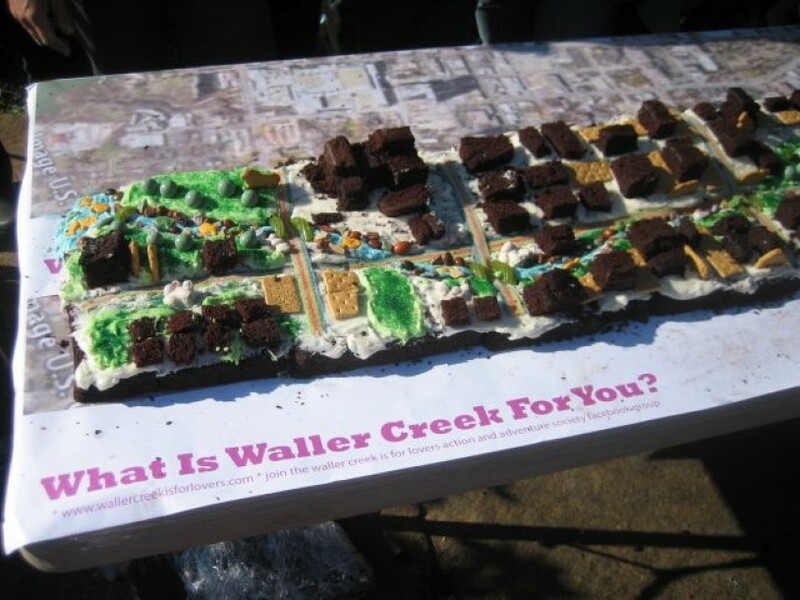 Contrary to the title of this article, the cake has not tangibly changed Waller Creek. 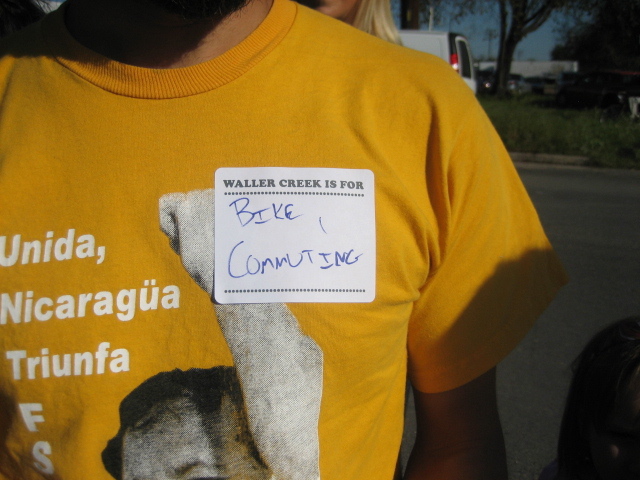 However, what it did do was jump start a sense of possibility, creating a critical buzz, a very visible demonstration of how community engagement in public planning processes in Austin might occur a bit differently. 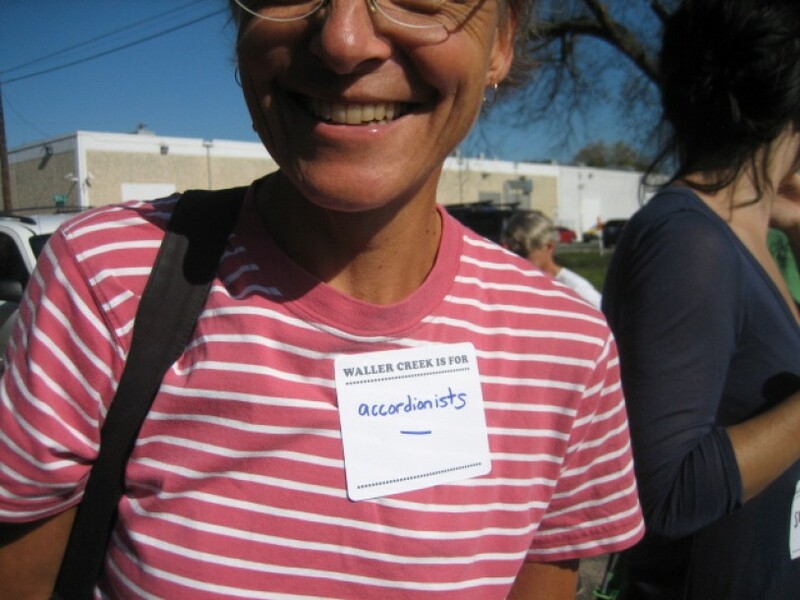 And this couldn’t have been more important because something isn’t working properly when, for instance, you only have three community members show up for a Project For Public Spaces-led Creek design charette. 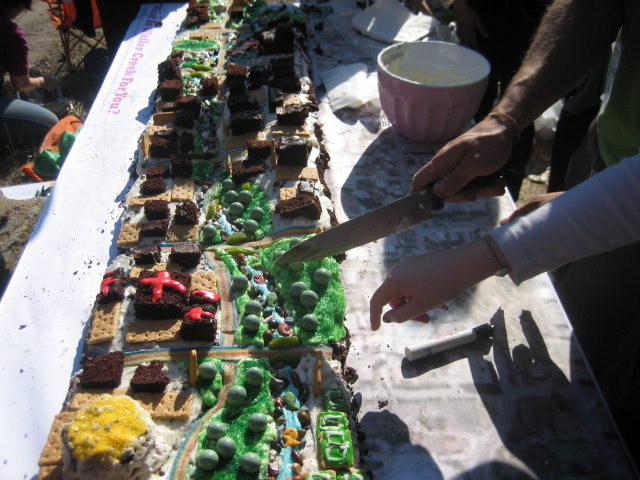 Coupled with earlier guerrilla space-testing activities that we conducted with our friends as the Waller Creek Is For Lovers Action And Adventure Society, the cake began to suggest how public design processes can and should change in order to make great public spaces. And we are quite sure that when properly woven into a larger process and discussion about a particular place, cake can be an excellent tool for changing a place. 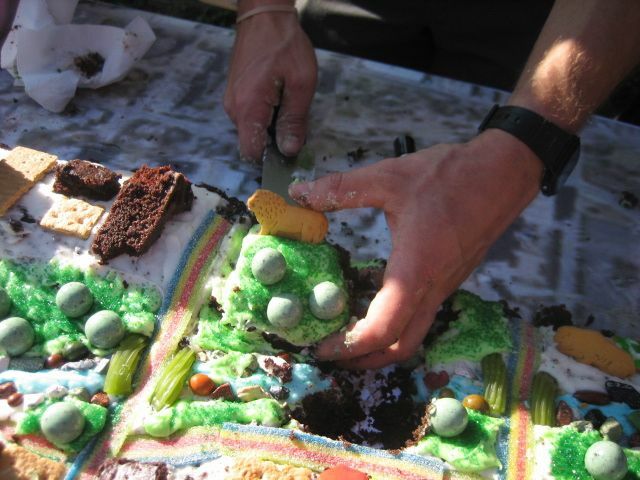 It is joyfully disarming (in its material and imperfection) allowing people the rare opportunity to approach a planning meeting with an open mind, it is collaborative, messy and dagnabit, it’s mighty tasty. 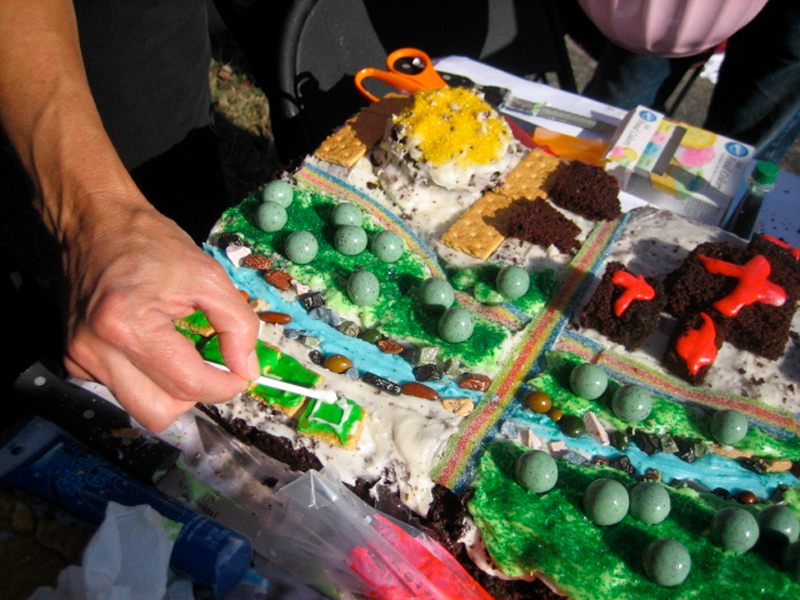 And by the way, you can bet your bottom dollar that in the coming year you will see a few of our design-built cake master plans in community design discussion and processes around the country. Yep, you can count on it, plans are very much in the works. Lynn Osgood, Lucy Begg, Robyn Ross, Greg Esparza, Ann Graham, Eleanor McKinney, Lindsay Patterson, Meegan Beddoe, Rachel Proctor May, Lauren Josephine, Heidi Schmalbach and particularly Kelley Gomez, our superstar baker. 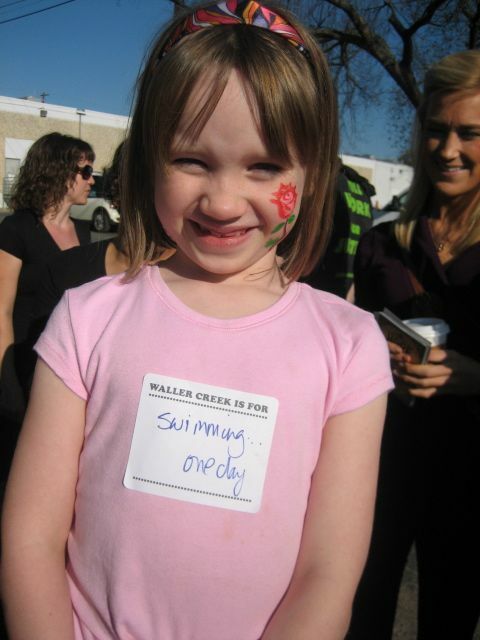 Tags: austin, temporary land use policy, Waller Creek Is For Lovers! Ok, this is to great! It is a fabulous combo: collaborative “craft project” (sorta like a December gingerbread house contest) and magnet for people meeting – the frosting is the glue that binds the two! Thanks for sharing this…wish more charrettes used this technique. Happy New Year!